The new Christmas Edition sports a sparkling look which is epitomized by it's two-colour strap.The 37 mm diameter case with its particular cloche shape and gold IP treatment is complemented by a dial in Ferragamo Red, or alternatively in fuchsia or champagne, embellished with the guilloché design and diamond-studded indexes on the rehaut. The Swiss Made quartz movement has a crown at 12 o’clock.Asymmetrical lugs support the vegetable-tanned calfskin strap, which is available in three two-colour versions: red with violet detailing, beige with red croco-print detailing, and fuchsia with orange detailing and contrasting colour stitching. 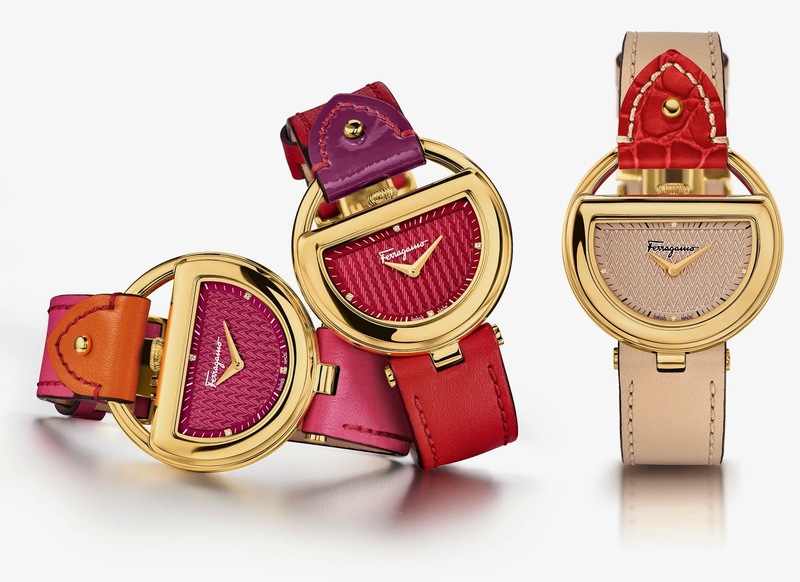 This exclusive line for next Christmas will be on sale from October 2014 in Salvatore Ferragamo boutiques, from authorised retailers or online at www.ferragamotimepieces.com.